How Is It To Be A Bella? 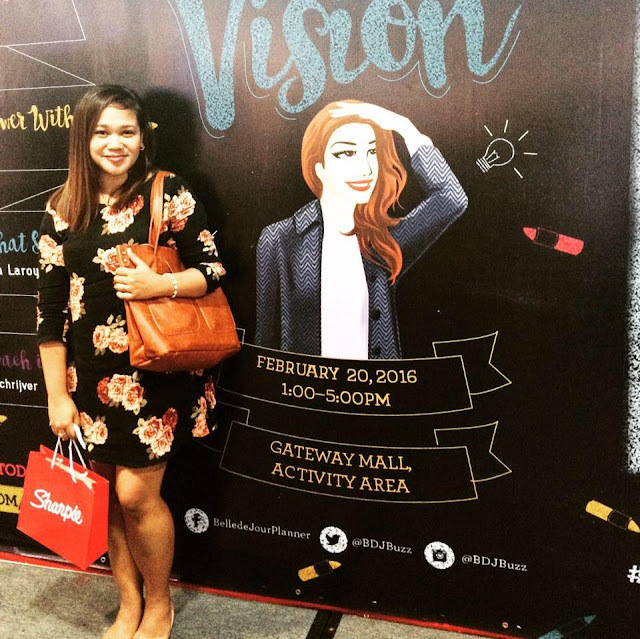 Bella is what you call to all girls who has Belle De Jour Planner, registered or member of BDJ, or even a follower of their social sites. That's how it's easy to become a Bella. 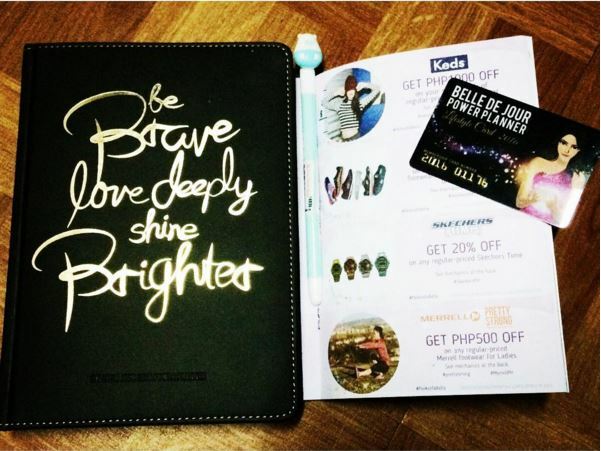 I'm a newbie Bella, because I recently bought their planner last January this year. A lot of girls in instagram even in facebook sharing their newly bought planner and when I saw one in National Bookstore, I know I will have it someday. And yes, wish granted. I just love everything about it. Wish I have photos to show you how awesome this planner is. It consist of 192 full color pages plus over 40,000 worth of coupons. I bought this for P680 at National Books Store. I registered my lifestyle card online and made a tour of their website. This is really a great community for all young ladies. They have so much stuff, raffle prizes, events, tutorials, video clips, and a lot more. Check their website ilovebdj.com and bdjbox.com. You don't need to have a planner to get an account, even you don't have you can still sign up on their website. When I decided to become a member, I noticed they have a Bella ranking for each participation. To know more about their Bella participation points just click here. They have an ongoing giveaway where you can win a 50" Haier Smart TV. I am hoping to win this giveaway so I used my coupon and submitted my entry. 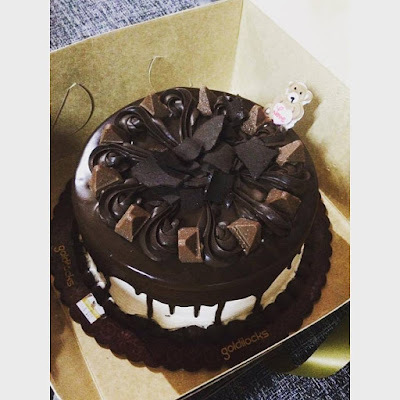 It's my son's 9 months celebration and my husband's birthday, a double celebration, and this will not be completed without a cake. I remember I have a Goldilocks coupon from my planner and got 10% off for a premium cake. Aside from that I also made some reviews on the products that I used to add points on my account and never thought I will receive an email for being a top reviewer. I got pair of Sunnies as my prize. Yay! I feel very lucky. That inspires me to have more points on my account and then I found out their upcoming event, the BDJ Woman with Vision Rendezvous. I followed their mechanics on how I can get an invitation and luckily I was chosen to attend their fabulous event. Yey! 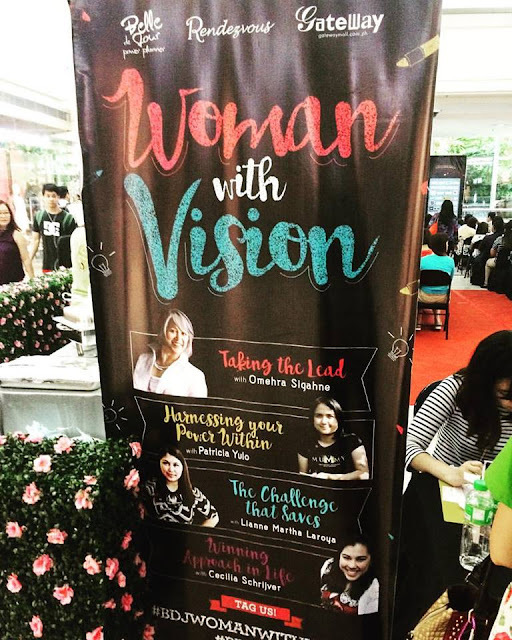 To know more about what happen on the event, check my post about BDJ Woman with Vision Rendezvous. I learned a lot from the four speakers, meet fellow bellas, had so much fun with games and raffle prizes and went home with loot bags. Look at us with our prizes and loot bags. Perks of a Bella! I written everything I experience about the event, then I saw they are having a blog contest. Since mine was already published on my blog, I submitted my entry. Guess what? 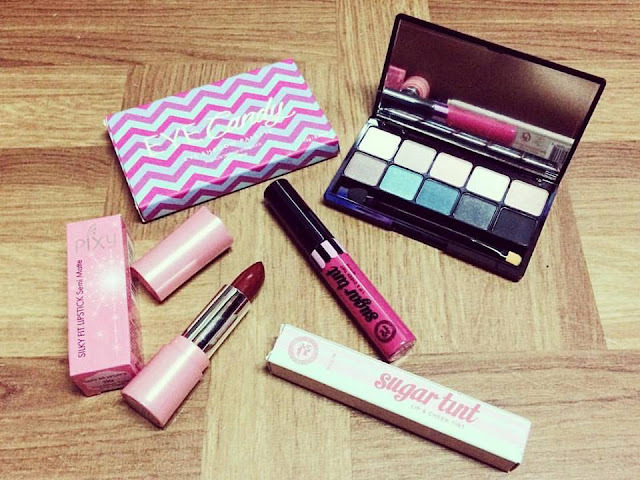 I won the blog contest, not just me but I have two other bloggers won the prize. I won 1 Pink Sugar Tint, 1 Pixy Silky Fit Lipstick, and 1 Pink Sugar Eyeshadow Candy. Isn't it nice? Now I'm aiming to be an MVP Bella. The highest rank for all bella ladies. They will have an upcoming event on April 16 which is BDJ Women's Summit: Women Helping Women. You can purchase their early bird ticket for only P600. 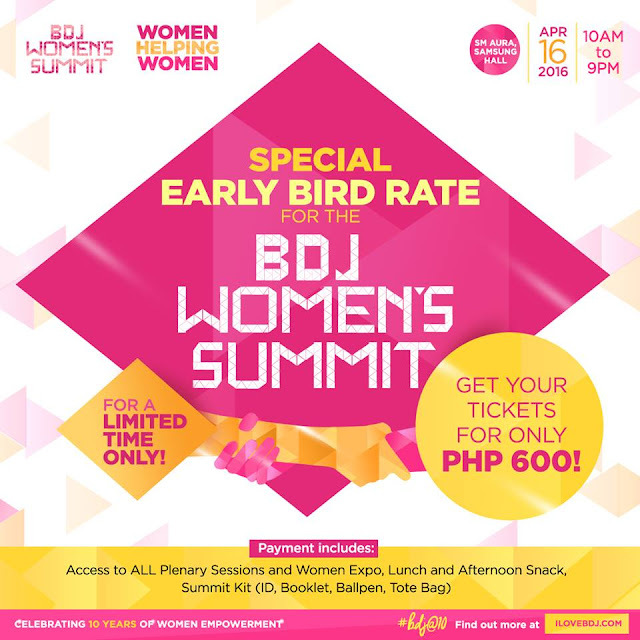 The BDJ Women’s Summit will be a highly interactive and experiential day. But more than the impressive line-up of guests, this will be ALL ABOUT YOU – this will give you a glimpse on what YOU, as an individual and WE as a community, can do for our society, also experience powerful practices, hear personal stories and learn about inspiring initiatives that can help pull ourselves together as never before - individually and collectively. No money? 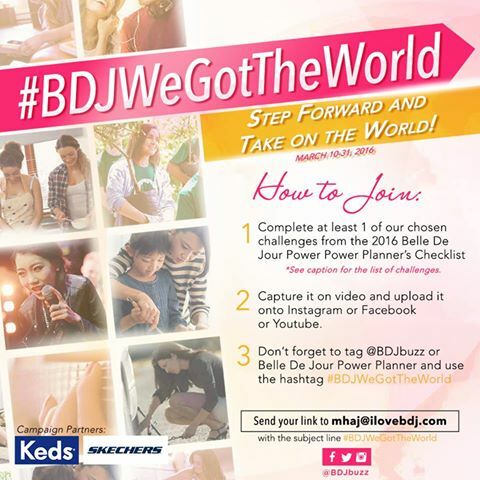 Don't worry because BDJ is giving away free tickets plus prizes from Sketchers and Keds. Click here to know how to win their free tickets. You have until March 31st to accomplish and submit at least one challenge. I'm going to join this and hope I will be a lucky girl to win a ticket. Being a Bella is an exciting, spontaneous and fabulous feeling for a young mother like me. I thought this kind of activity is for all single ladies and young girls who has less responsibilities in life and always free to go. Well, I was wrong. They give everyone an opportunity to shine, help them to be more confident, and never neglect anyone who wants to be a Bella. I met some of people behind this community and they are kind, approachable and always welcome you. So if you want some spice in your life, this is a good opportunity for you. Well, hope to see you in their upcoming event Bellas. If you see me, please approach me. I will be more happy to meet you too. Thanks for reading. Have a nice day! I've heard about BDJ for years already too bad i never get the chance to sign up for an account but i really think its worth it so I might do it one of this days once I'm no longer busy. Wow, it's awesome to be a Bella! And you're really lucky with your awesome prizes!!! I initially thought this has something to do with singing (as in Pitch Perfect), LOL! I have always wanted to get their planner because i am such a sucker for all things paper. :) I didn't even know there's a community for BDJ owners. Will definitely get one now. Hey I was there! But I was seated waayy at the back. :( So I didn't get photos worthy enough to blog. Congrats on winning! I'm a Bella, too! Yet too busy to attend such events. Haaay. The summit looks interesting and fun pa naman. Would want to be part of this Bella community. You've got quite a stash there from the BDJ event! I wish I could attend the event too one of these days. Awesome prize! I used to be a Bella, too -- I think I used BDJ planners for was it 2 or 3 consecutive years? Then I tried exploring other planners. Their coupons are always great though! Next year I'll be a Bella.I wanted to buy the planner but hesitated at the last minute.Lucky you btw! I've a using of BDJ planner last year and I enjoyed it soooo much! Your sunnies i love too! So chick. I've been a Bella for years and I love it. :) I haven't been able to join any of their events though. I hope I get to join the upcoming summit. I've been a Bella for years and I love it! :) I haven't been able to join any of their events though but I hope I get to go to the upcoming summit.